As part of the PVNET open house tomorrow, I will be demonstrating Lightroom CC and Photoshop CC. This is part of an huge event being presented by PVNET at the Peninsula Center immediately below the Regal Theaters. Come to the Open House and try your hand at flying a quadcopter or racing a slot car! Click on the figure below to find out more. I will be teaching both Photoshop and Lightroom classes at PVNET’s Peninsula Center location this summer. 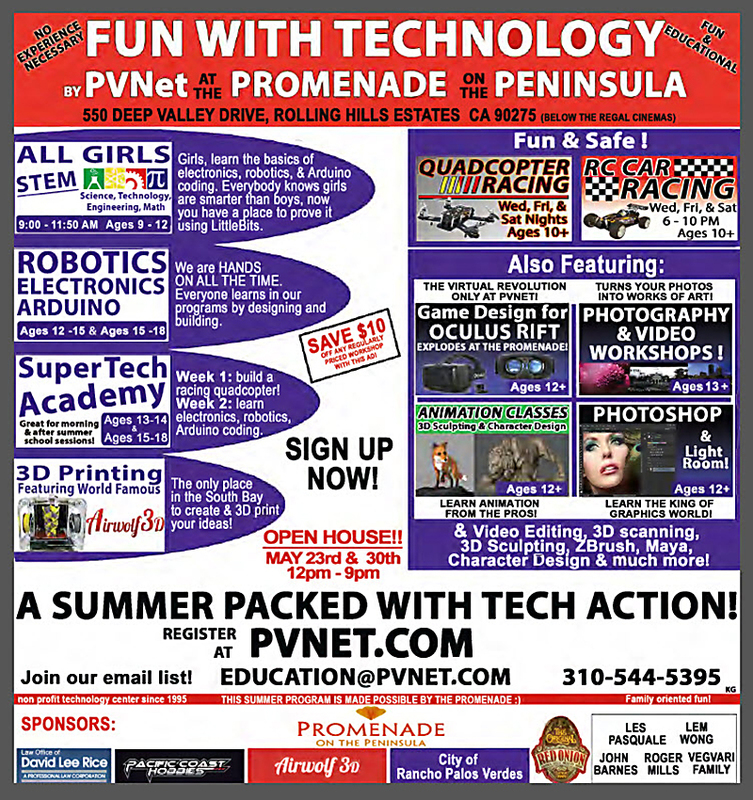 PVNET has secured a huge space (about 15,000 square feet) on the Promenade in the Rancho Palos Verdes Peninsula Center for the summer. It is located immediately below the Regal Theaters, where a book store was a few years ago. Included in their facility will be a netted area to fly quadcopters and race RC cars. There are multiple class rooms being set up which will include 24 computers. They have big plans for all kinds of technology activities and training this summer for all ages as illustrated in the poster below. There will an Open House on May 23rd and May 30th. I will be giving a free workshop on using Photoshop CC and/or Lightroom 5 on May 30th. When more details become available, I will post them here and on my Facebook page.